ELIZABETH CITY, NC. – Right now the Jeep brand is massively trendy, and Jeep pretty much has the unique ability to sell anything that has its name stamped on it. For years, rumors have swirled about the possibility of a Jeep truck added to the vehicles lineup and ultimately, Jeep still has plans to make a pickup truck, it just might take awhile. With Jeep struggling to make enough Cherokees and Grand Cherokees to meet the current sizable demand, a truck option might be a few years down the road. Head of Jeep Mike Manley was interviewed by The Detroit News and said even though he believes a pickup truck belongs in the Jeep lineup, the company has higher priorities at this time. The idea of a new, small sized Jeep pickup has been alluring fans since the Comanche pickup was discounted more than 20 years ago. Jeep still has plans to make a pickup truck, it just might take awhile, and many say that now is the perfect time to think of the next model in Jeep’s portfolio. The development for the next generation Jeep Wrangler, which has the potential of a base for a small pickup, begins in 2017. IHS Automotive senior analyst Stephanie Brinley stated “How many SUVs can you make? They’re running out of space within their own lineup to generate sales with new product. 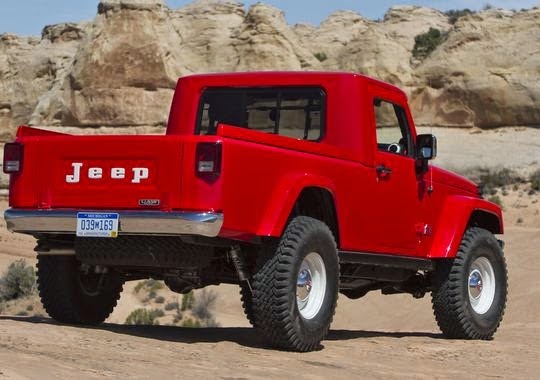 The only one that makes sense is a small/compact pickup truck.” The last production model of trucks made by Jeep was the Comanche, which sold about 197,000 units between 1986-92. Ultimately, many automotive critics believe that if a Jeep truck concept were pushed through, it would most likely be the next-generation Wrangler to pick it up. Analysts speculate the truck would be smaller, and would rival GM’s 2015 midsize Chevrolet Colorado and GMC Canyon, making the model smaller makes sure there would not be any in-company competition with the Ram 1500. So, until Jeep finds the time AND the right model, Jeep truck enthusiasts will have to just be patient and believe that hopefully, their patience will be rewarded! We have a great Jeep inventory at Perry Auto Group, so why don't you stop by and see what all the fuss is about! Perry Auto Group has two dealership locations to serve you better at 1005 W. Ehringhaus St, Elizabeth City, NC, 27909 or 1001 Halstead Blvd Elizabeth City, NC 27909. Feel free to call us with any questions at (252) 338-9100.